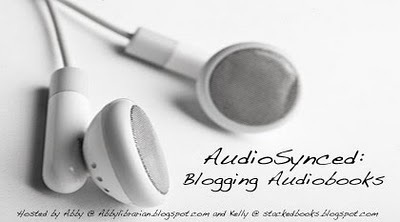 Abby the Librarian: AudioSynced July Roundup! It's time for another AudioSynced Roundup! It's my pleasure to present you with audiobook reviews posted around the blogosphere during the month of July! If you've got a review or post that I missed, please leave a link in the comments or drop me a line at abbylibrarian@gmail.com and I'll update the post! Audiobooks are just the thing to spice up your next road trip and Amanda at The Hub posts about great audiobooks for road trips. If you're not quite sure about audiobooks yet, be sure to check out Random House Audio, where you can download audiobook samples to try them out. The Audio Publishers Association announced the winners of their Get Caught Listening video contest. Check out the top three videos at Listen Up. Remember, you can find tons of reviews at Audiobook Jukebox! At Devourer of Books, Jen's doing a weekly roundup of audiobook reviews on Fridays. Check out Sound Bytes and make sure to add your links to the roundup! The Best Bad Luck I Ever Had by Kristin Levine, read by Kirby Heybourne, reviewed by Brenda at proseandkahn. Brenda says, "Kirby Heyborne's performance is pitch perfect... He completely and comfortably inhabits Dit." The Emerald Atlas by John Stephens, read by Jim Dale, reviewed by Mary at Sprout's Bookshelf. Mary says, "The plot drags a bit toward the end, an instance in which listening to the audio was a huge benefit, as Dale's masterful narration keeps it interesting." The Lion, the Witch, and the Wardrobe by C.S. Lewis, read by Michael York, reviewed by Melissa at Book Nut. Melissa says, "...to be thoroughly honest, it didn't stick with me. Sure, I enjoyed it while I was listening to is... But, two weeks later... all I can remember about the story was that it was nice." No Passengers Beyond This Point by Gennifer Choldenko, read by Becca Battoe, Jesse Bernstein, and Tara Sands, reviewed by Lee at Reading with my Ears. Lee says, "Each of [the narrators] is very good, creating consistent and vocally interesting characters that seem true to the author's intent." One Crazy Summer by Rita Garcia-Williams, read by Sisi Aisha Johnson, reviewed by Mary at Sprout's Bookshelf. Mary says, "Johnson becomes each of the girls in turn, bringing out layers of their personalities that I might otherwise have missed." The Other Half of My Heart by Sundee T. Frazier, read by Bahni Turpin, reviewed by Lee at Reading with my Ears. Lee says, "Turpin's voice is appropriately youthful and giggly for Minni and Keira (as well as the other pageant ... er, program contestants), but she also does a great job with Grandmother Johnson. She gives her a slow, no-nonsense delivery perfect for an old Southern lady who is hanging on to her dignity, but boy is she tired. I could hear that woman's colorful history in her voice." The Penderwicks at Point Mouette by Jeanne Birdsall, read by Susan Denaker, reviewed by Amanda at A Patchwork of Books. Amanda says, "Totally charming and fantastic for reading aloud as a family this summer." The Penderwicks at Point Mouette... also reviewed by Allie at Reading Everywhere. Allie says, "Listening to this audiobook is like having a dear aunt read you a bedtime story. I wished it would go on forever." The Wee Free Men by Terry Pratchett, read by Stephen Briggs, reviewed by Melissa at Book Nut. Melissa says, "...listening to the audiobook made this books so much more loveable and enjoyable than it already was." A Wrinkle in Time written and read by Madeleine L'Engle, reviewed by Lisa at Shelf-Employed. Lisa says, "There is something special about hearing an author read her own book. There is less room for personal interpretation, but the listener can be sure that she is understanding every nuance that the author wishes to convey." Beautiful Creatures by Kami Garcia and Margaret Stohl, read by Kevin T. Collins, reviewed by Melissa at Mel's Books and Info. Melissa says, "Collins does an outstanding job of narrating this novel. His southern accent was not over the top, but added just the right amount of character to the novel." Blink & Caution by Timm Wynne-Jones, read by Macleod Andrews, reviewed by Lee at Reading with my Ears. Lee says, "The characters matter enough to you and their situation is so convincingly perilous that you've got to know NOW what happened." Body Work by Sara Paretsky, read by Susan Ericksen, reviewed by Lee at Reading with my Ears. Lee says, "Now, Ericksen is clearly a skilled narrator who can create individual characters (which she does here) and can keep a lengthy novel moving along, but -- in spite of her nicely subtle Chicago accent -- she just doesn't feel right in this part." The Book Thief by Marcus Zusak, read by Allan Corduner, reviewed by Laura Ashlee at EARphoria. Laura Ashlee says, "All I know is that from the very first paragraph, I was hooked." Death Cloud by Andrew Lane, read by Dan Weyman, reviewed by Lee at Reading with my Ears. Lee says, "[Dan Weyman] sets a cracking pace, but reads Sherlock with a quietness that aptly describes the shy, introspective boy he is." Die for Me by Amy Plum, read by Julia Whelan, reviewed by Beth at A Foodie Bibliophile in Wanderlust. Beth says, "Julia Whelan was the narrator and she was amazing. Her French accent sounded authentic and her voices for the different characters were varied and believable." The Knife of Never Letting Go by Patrick Ness, read by Nick Podehl, reviewed by Brenda at proseandkahn. Brenda says, "[Nick Podehl's] performance was amazing. Perfect timing, perfect accent, I was completely drawn in and lost in a totally alien world." Linger by Maggie Stiefvater, read by Dan Bittner, Pierce Cravens, Emma Galvin, and Jenna Lamia, reviewed by Beth at A Foodie Bibliophile in Wanderlust. Beth says, "The audiobook of Linger was a wonderful presentation..."
Shiver by Maggie Stiefvater, read by Jenna Lamia and David LeDoux, reviewed by Mollie at Mollie's Yattitude Problem. Mollie says, "Jenna Lamia, who voices Grace's parts, is an excellent reader who was perfect for the role. David LeDoux (Sam), is equally as good at reading, but I don't think that his voice fit the role." Uncommon Criminals by Ally Carter, read by Angela Dawe, reviewed by Laura Ashlee at EARphoria. Laura Ashlee says about the narrator, "Though I still think she sounds a little old to be Kat, I like her voice." The Alice Behind Wonderland written and read by Simon Winchester, reviewed by Jen at Devourer of Books. Jen says, "I simply adore Simon Winchester narrating his own work... Winchester comes across as a charismatic scholar whose passion for his own research is infectious." Darkfever, Bloodfever, Faefever, and Dreamfever by Karen Marie Moning, read by Joyce Bean (Dreamfever is read by Natalie Ross and Phil Gigante), reviewed by Laura Ashlee at EARphoria. Laura Ashlee says, "If you’ve read the Highlander series or just like paranormal mystery (like Sookie Stackhouse), you’ll enjoy this one." The Help by Karen Stockett, read by Jenna Lamia, Bahni Turpin, Octavia Spencer, and Cassandra Campbell, reviewed by Laura Ashlee at EARphoria. Laura Ashlee says, "This is the best book I've read all year. Definitely the best audio book I've listened to." The Hitchhiker's Guide to the Galaxy by Douglas Adams, read by Stephen Fry, reviewed by Laura Ashlee from EARphoria. Laura Ashlee says, "...it's a relatively funny and short listen, and Stephen Fry does a good job with the narration." The Thousand Autumns of Jacob De Zoet by David Mitchell, read by Jonathan Aris and Paula Wilcox, reviewed by Lee at Reading with my Ears. Lee says, "David Mitchell's The Thousand Autumns of Jacob De Zoet clocks in at 19 hours... and I enjoyed every minute of it." Unfamiliar Fishes by Sarah Vowell, read by Sarah Vowell (with a bunch of guests), reviewed by Carin at Caroline Bookbinder. Carin says, "I know some people find Ms. Vowell's voice abrasive or grating, but I find it very endearing."